To evaluate drug use in accordance with HEDIS standards, the following data must be placed into a series of algorithms used to identify those members with prescriptions that serve as disease indicators. The details about these lists and their ICDs are provided by the national HEDIS website. The following is just the listing of these drug tables used to diagnose patients based on their prescription drug use history. This document can be accessed for its links to the tables at http://www.ncqa.org/tabid/1091/Default.aspx (most recent date of access April 12, 2010). There are several important notes to make regarding the use of this data for identifying a patient’s medical history. First, it is important to use the drug list alone in a conservative fashion. The history of a script of any kind does not imply a history fo a given disease. In many cases, there are times when these prescriptions are produced for reasons that do not conclude that the patient bears the disease or condition, especially when this disease or condition has some sort of permanent status associated with its onset. For example, anti-seizure medications may be provided to an individual with a history of seizures or epilepsy, even if that history is for a short period of time, for example due to a recent motor vehicle accident followed by an incidence to convulsions or secondary generalized seizures. To produce supportive document for the history of epilepsy, one has to document ongoing use of the medication along with the appropriate clinical activities related to a possible diagnosis of epilepsy, such as an ongoing visit with a neurologist and the performance of an EEG or nocturnal sleep monitoring process. Furthermore, just because an individual is on an anti-seizure medicine, we cannot be certain the reason is epilepsy-related unless the appropriate ICD is attached to the case history. Some individuals for example are prescribed antiseizure medications for other neurological conditions, such as fibromyalgia. 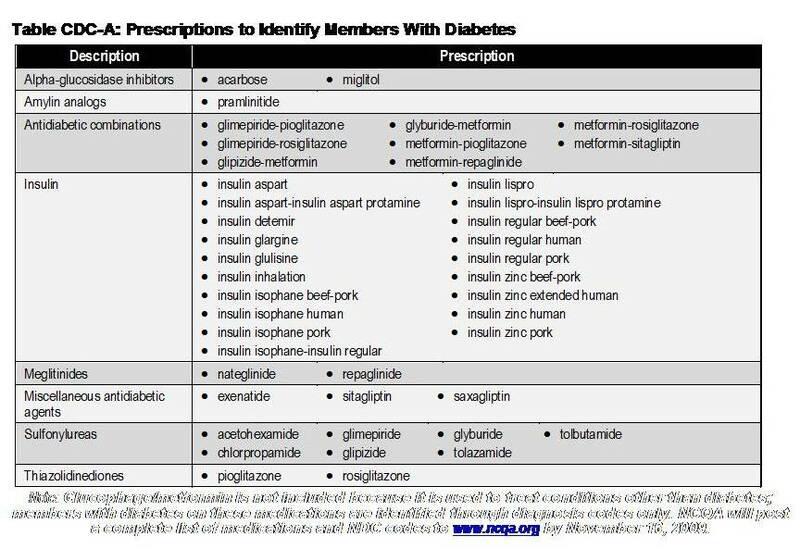 In the following example of a HEDIS table with Diabetes medications (also accessed via the above link), most of these drugs may be considered indicators of a relevant history, although not indicative of a diagnosis if noted on their own in claims, prescription data, or medical records data. Since these are the factors used by an agency performing an eligibility search based on HEDIS-NCQA guidelines, this information is used specifically to define and corroborate such factors as insulin use or the need for non-insulin medications. One simple way to make use of this day in a pharmaceutical industry sense is to simply measure the various medications listed on each of these tables, and develop a way to quantify and report on these outcomes. This data alone is not at all helpful in the long run, due to ever-changing paradigms and protocols used to define the related treatment guidelines, still, such an approach to beginning to document prescription use in relation to HEDIS methodologies at least suffices to some extent, and is better than non-directed reviews of overall prescription drug information. Again, the most important component of this type of research is to make use of the prescription information, but only in conjunction with claims related diagnostic codes verifying the medical history under review. In the flowchart used to depict this Scripts-first approach to analyzing patient history, the following figure again demonstrates that is just one of two approaches that need to be taken when evaluating the health of members with diabetes in general. The use of insulin or some sort of sulfonylurea suggests diabetes history, but not necessarily its level of severity. We need ICD to rule out Type I (inherited) DM and to rule other causes for diabetes onset such as post-surgical or pregnancy-linked, and a full years worth of diagnostic indicators usually to verify the diagnosis as an non-excludable, ongoing condition. DMARDS — used to identify RA patients for another non-HEDIS defined measure briefly discussed on the previous page. The various measures related to Potentially Harmful Drug-Disease Interactions in the Elderly and Osteoporosis Management in Women who had a fracture (since most analyses involve populations <65 yo, these may not be applied too much). A similar Assessment is made of the Claims Data using algorithms developed from HEDIS protocols. For the non-HEDIS measures proposed for this work, similar algorithms are produced based on combined Claims and ICD-case or patient information. The application of this detailed dataset first requires a reclassification of the ICD groups data into Groups Health format data. Determination as to whether or not to merge certain study types into single programming processes or Groups Health formats will depend upon population size and the size of subpopulations that qualify for each phase in this review process. Some of the same methods implied by the HEDIS processes above may be employed if need be for Groups that cannot be categorized using any predefined, traditional means. The breakdown of claims codes and the related flowchart is available as part of the HEDIS methodology book. HEDIS methodologies are also applicable to this review of pharmacological data, with the exception that the time frames to completion for each of the tasks have been shortened. The following summarizes the process by which the above actions should take place over an 18-month time frame. Note: Ongoing monthly evaluations should be performed, with reports on progress generated. This will be carried out throughout the development, testing, analyses and reporting phases of this work. Step 4 – Present Work-ups of these Initial Measures [4-6 months]; produce preliminary reports for field testing and feedback. Step 8 – Produce Revisions to Processes; Produce New Reports to Reviewer; Develop recommendations on how to continue.